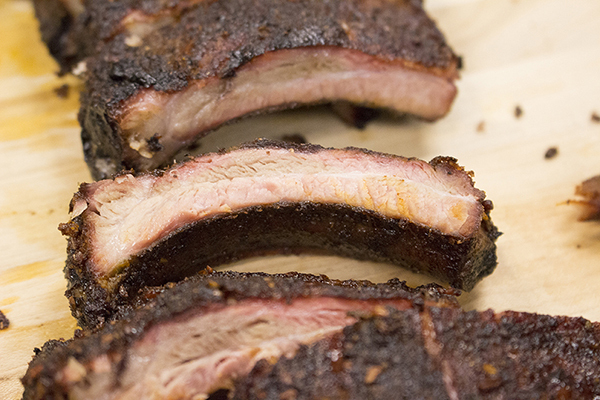 Ribs: Succulent, Aromatic, and Most Importantly Easy! There’s nothing that will make neighbors more jealous than the wonderful smell of smoked ribs! It’s become a summertime tradition of mine to wake up early, set up the smoker, and fill the neighborhood with the sweet smells of barbecue on the weekends. The long cook time allows me to be outside working on the yard, playing with my dog, or just enjoying a cold one in the sun while the ribs sweat it out in the Smokey Mountain Cooker. Best of all, they’re really simple to cook! You can make ribs on any type of grill! Here’s a setup guide to get you ready on charcoal, gas, or a smoker. Apply a rub to both sides of the ribs. Here’s a great guide on creating one. Kitchen Tip: Rub some mustard onto your ribs before applying the rub. It adds a nice flavor and it will help your seasoning stick! To dial the grill into the smoking range (225°-275°F), you can adjust the dampers on the charcoal models and the burners on the gas models. Once the grill is in that range, go ahead and place your ribs on the cooking grate. About 10-15 minutes after you’ve put the ribs on, check the temperature of the grill and make any necessary adjustments to keep the temperature nice and low. Check the grill every 30-45 minutes to ensure that it remains in the smoking range. If it’s too hot, close the dampers a little. If it’s too cold, open the dampers up. Remember, on the charcoal kettle model, you’ll need to add between 8-10 coals per hour in order to maintain temperature. After about 2.5 to 3 hours the meat should be pulling away from the ends of the bone and a nice bark should have formed. Individually lay them onto a sheet of foil. Baste each rib with some pineapple, apple, or other fruit juice and close the foil to impart extra flavor during the last portion of the cook. Put the foil wrapped ribs back on the grill or smoker for about another hour. Take the ribs out, remove from foil, and let rest for at least 10 minutes. This allows the juices to redistribute and the ribs to be more flavorful. Finally, baste with BBQ sauce, and enjoy! Now you can make your neighbors jealous too! For more rib inspiration check out other ideas here, here and here!